Should Wearing Anti-homophobic Shirts be Banned in Schools? Earlier this month a high school student from Ohio was banned from wearing a t-shirt that was meant to be supportive of National Day of Silence, an event created to draw attention to the silencing effect of anti-LGBT bullying and harassment in schools. 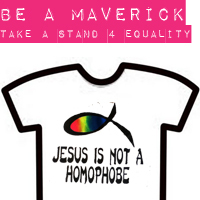 Maverick Couch is one of the only openly gay students at his school and felt discriminated against when he was forced to change his shirt that said “Jesus is not a homophobe,” complete with a rainbow colored Christian fish symbol. His principal claimed that the shirt brought state and religion together and decided that it was inappropriate. Maverick, feeling as though his rights were being taken away, searched for every possible solution to this problem. He continuously attempted to reason with school officials in hopes that he would be allowed to stand up for himself and his rights. After working tirelessly to reach his goal, he finally decided that he needed to reach out for assistance. Maverick contacted Lambda Legal to find some help and support. Lambda Legal strives toward gaining equality for the LGBT community, and the organization decided to take action after hearing Maverick’s story. Lambda sent a letter to the school district to try their own hand at reasoning with the principal, unfortunately to no avail; Maverick was still threatened with suspension for wearing the shirt. At this, Lambda decided to sue the Waynesville school district. During the process of filing the suit, the high school principle decided to let Maverick wear the LGBT affirming shirt, but only on National Day of Silence. While this is a slight improvement, it really doesn’t change much of anything. This conflict has multiple aspects that stem from the central problem. The main issue is that Maverick is being banned from freedom of expression, freedom of religion, and equal treatment. The school principle forbade his student from wearing a Christian symbol painted in rainbow colors. However, I have no doubt that the same fish in a solid color would not have been given a second thought. The argument here is ridiculous. If a student is allowed to wear a shirt depicting their religion or a cross around their neck, a gay student should be able to wear something that symbolizes his or her own beliefs. It would be easy to go on and on about what someone should and shouldn’t be able to do. However, that doesn’t really get us anywhere. What will progress us toward equality is seeing more students like Maverick stand up for what they believe is right. Students having to fight for equal rights in this day and age seems incredibly outdated. Unfortunately, it still remains necessary. I think that calling our government and equality organizations into action to enforce consequences on biased and unfair staff or administrators would be a good start. Having role models like Waynesville’s principal will only promote bullying and unequal treatment among students. To see true equality and a lack of discrimination, youth cannot have leaders like this one. I commend Maverick for reaching out to resources like Lambda Legal. In regards to so many events, we have seen that most institutions or entities do not like bad publicity. Bringing an outside organization into the battle was a very good move, and obviously it worked, if even just to allow Maverick to wear his shirt on a specific day. Raising awareness about bullying, discrimination, and violence against LGBT people seems increasingly more difficult when hearing stories like this one. To eliminate such negativeness, we must see leadership that mirrors equality. The fact of the matter is, we still have a long road ahead of us in the fight for equality. What do you think would progress us out of this deep hole of discrimination? Is working toward finding better leadership the right path, or should we continue to advocate against bullying? Share your thoughts on how we can make our schools equal for all students. Kristen Youngs is a graduate of the University of North Texas. She majored in Applied Arts and Sciences with concentrations in nonprofit management and anthropology. She is passionate about international nonprofit work, which helped influenced her degree choice. Kristen is an avid traveler and loves outdoor sports. Her research focus areas while at the SISGI Group were international LGBT issues, education development in impoverished and rural areas, and global women’s rights.